Professor Layton for people who watch Hannibal. If you’ve ever thought that one of those Escape Rooms, where you’re locked in with buddies and have to solve puzzles to win your freedom, sounded like fun, then Zero Time Dilemma is right up your alley. Its version of escape rooms comes with rather more murder, but the core concept is the same: get locked in various rooms, solve clever puzzles to get out and, hopefully regain your liberty. Oh, and try not to die. There’s that, too. Zero Time Dilemma is the third game in the Zero Escape series, which includes 999 and Virtue’s Last Reward. Strictly speaking, you don’t have to have played them to jump into ZTD, but you’ll have a far better experience if you do. 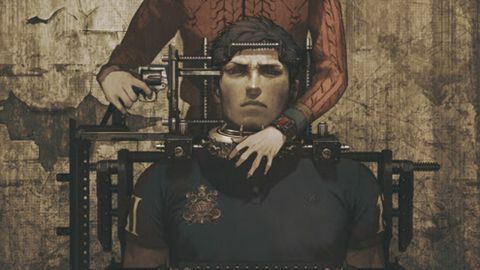 Zero Time Dilemma makes ample references to its predecessors, Virtue’s Last Reward in particular, and events from both games play a part in ZTD’s overall narrative. They’ll also help you immediately comprehend ZTD’s highly unusual game structure, which hops between visual novel info dumps and multilayered puzzles with little consideration for linearity. You’ll find yourself switching between three teams of characters experiencing different events at the same points in the time stream throughout different histories...it makes sense in context, I promise, but it certainly helps to have gone through it before. Masked villain Zero (a new one) is tormenting a fresh allotment of nine victims, locking them in different wings of a bomb shelter 50 meters underground. There’s only one door out, and it will only open after at least six people have died. So, everyone can sit around and get to know each other really well over the next several decades, or they can betray each other, commit a bunch of murders and see daylight again. You do have to make choices in Zero Time Dilemma, but you’re also encouraged to explore each and every option. In fact, sometimes you have to go down routes you’d otherwise avoid in order to unlock new rooms to explore. You can be trustworthy or devious, kind or vicious, safe in the knowledge that the game isn’t judging you or expecting you to behave a certain way. These are paths meant to be travelled, so go ahead and hack up that girl with an axe. It’s all good. Deaths will absolutely happen and they are brutal, by the way, including being trapped under showers of hydrofluoric acid, gutted with a chainsaw, and several different varieties of gunshot. That said, Zero Time Dilemma is not a gory game at all. Deaths typically happen off screen, and the violence that is visible is cartoonish. There’s some horrifying stuff going on in that bunker, but most of it is left up to your imagination. The puzzles of Zero Time Dilemma are marvelous, requiring lateral thinking but never demanding outside research. Everything you need is right there in front of you, so long as you know how to use it. There are a few old chestnuts like tile flipping and block sliding, but by and large the challenges make clever use of their locations, like a biolab, trash incinerator, and locker room. The one drawback is that you can’t jump between puzzles if you’re stuck; you must finish the story fragment that you’re currently in before you can begin a new one, so if you’re stumped, you have to abandon it and start from scratch later or tough it out. The game makes it as easy as possible to hop around, though, letting you fast forward through cinematics even if you haven’t seen them yet and allowing you to select any available game fragment individually. If you just want to jump back to a decision point to choose “yes” instead of “no” and see what happens, you can, without having to re-do everything that led up to it. Zero Time Dilemma’s story is very convoluted and a bit repetitious (you hear about a snail a LOT), but the game’s biggest downfall are its visuals, which are blocky and poorly animated. It’s painful to watch how much the lips don’t synch with the speech that’s coming out, and the gouts of blood that erupt from an injury more serious than a stubbed toe were apparently designed by a toddler with a red crayon. The long hair on the girls flaps around like it’s a living thing, and everyone has apparently had way too much caffeine based on how much their eyeballs twitch. It’s not an ugly game at all, but it’s super awkward. But does it really matter that the graphics are a bit naff when there’s a guy in a plague doctor mask running around drugging people because of the butterfly effect? It does not. Zero Time Dilemma is for Professor Layton fans who watch Hannibal, those who don’t mind wondering how a head ended up in the freezer. If you’ve already bought into the Zero Escape series’ charming kind of malice, there’s simply no question that you’ll enjoy this, too. If you find yourself curious about rescuing people from certain doom by solving puzzles, I strongly encourage you to at least start with Virtue’s Last Reward, and preferably go back to 999 and enjoy the entire blood-soaked journey.